The success of the river tunnel at Washington street has been considered sufficient to justify the Common Council in proposing to construct a tunnel under the main river, and two sites have been suggested—one at LaSalle street, and the other at State street. The committee of the Common Council, have we believe, favored the selection of LaSalle street, but as there has been no final action on the subject, the members of the Board of Aldermen, before acting, should personally examine the locality, and for themselves, see the irreparable injury that will be inflicted, without any possible public benefit which may not be equally secured by locating the tunnel at State street.. The tunnel, if constructed at LaSalle street, must have its open entrance for vehicles at the north line of Randolph street, and this open entrance must extend to Lake street, where it will be arched. This entrance, or approach, in the case of the Washington street tunnel, is 22 feet between the walls, and that width is the least that can be adopted for safety. The walls have a coping two and a half feet wide, and are surmounted by a railing. This makes the total width of the street occupied by the approach to the tunnel 27 feet. The width of the carriage-way on LaSalle street is 48 feet, if 27 feet be deducted for the tunnel, will leave a roadway on each side of but ten and a half feet. This, of course, will be insufficient, and will necessitate the use of much of the space now occupied by the sidewalks as a carriage-way. The sidewalks at present are 16 feet wide. It will be necessary to take eight or ten feet from each of these sidewalks and add them to the carriage-way in order to enable the latter to be passable for vehicles. This will leave the sidewalks on each side of LaSalle street, between Randolph and Washington streets, about six feet from the building line to the curbstone. 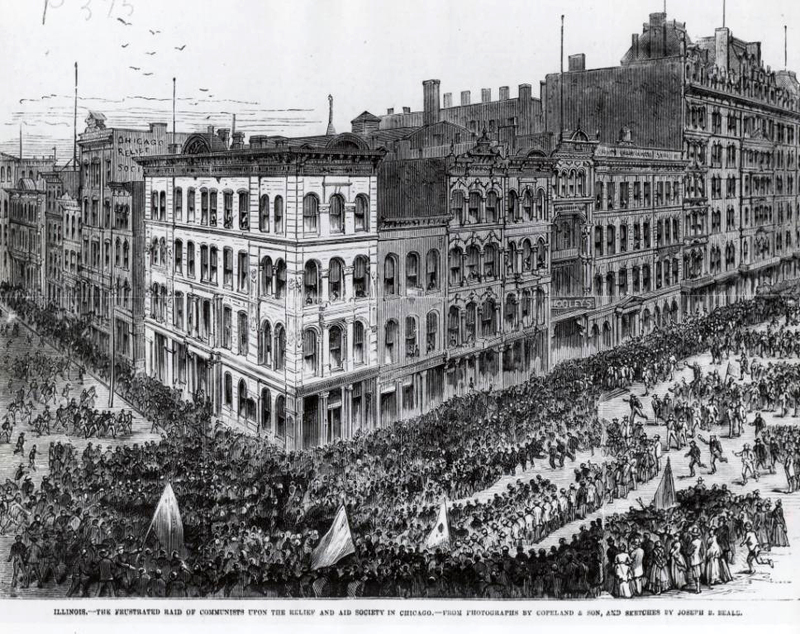 Let the Aldermen visit that street, which, during business hours, is crowded to excess, and judge for themselves the effect of allowing a sidewalk of but six feet wide. Large and substantial buildings have been erected on that street, and the most of them built with the lower story in the nature of a basement, having an area, used as an approach, of descending steps, three to four feet from the building line. To secure sidewalks six feet wide will involve the necessity of closing up all these basement stores and offices; or, if they are not closed, the space left available for sidewalks will be reduced to from two to three feet; and we are sure that every Alderman will, upon inspecting the locality, admit that such a proceeding will destroy the value of the whole property, and deprive the public of the convenience of the street itself. Now compare this condition of affairs with State street, if the tunnel be placed there. State street has a total width of 120 feet, of which 88 feet are given to the carriage-way, and 16 feet to each of the sidewalks. To build the approach in the centre of the street, will leave a carriage-way on each side of over 30 feet, and in no way interfere or diminish the width of the sidewalks. The construction of the tunnel at State street will not interfere with the convenient use of the street by the general public, nor will it incommode the business of any store or dealer on State street. The roadways will be wide enough for vehicles to receive and discharge their loads without obstructing the regular use of the street. The sidewalks will remain undiminished; and State street, instead of being destroyed, as will be the case of LaSalle street, by the tunnel, will be ornamented, and have an addition made to its already great attractions. If Aldermen, voting on this subject, will examine both localities, we are sure they will not perpetuate the injustice of putting the tunnel at LaSalle street, while State street is at their service for that purpose. The plan proposed for LaSalle street is in the main features very similar to the one already constructed\ at Washington street. Its total length, including approaches from Randolph street on the south and Michigan street on the north will be 1,930 feet. The net estimate for the work is $457,342.32, but in view of the possibility of occurrences difficult now to foresee, an appropriation of $500,000 is asked for. The most expensive work in which the city has been engaged during the past year is the La Salle Street Tunnel. Ground was broken on November 3, 1869, and since then, the work has been almost continuously in progress. The experience gained in building the Washington street tunnel has been of great service and value in the present case. The character of the soil will be so well known in future, and the difficulties to be overcome can be so accurately calculated, that little more will be thought of constructing a tunnel than of building a house. The north half of the passage way was completed in the summer, and now the southern half is being pushed forward with great rapidity. The archway has been built 175 feet south from the center of the river, so that now extends beyond where the deck wall is to be. South Water street, at the foot of La Salle, is excavated, and soon the picks and shovels will make a trench in La Salle nearly as far south as Randolph. The roadway entrance will begin 40 feet north of the south line of Randolph, ands be open as far as Lake, the distance from there to the river being covered. Since the coffer dam was made tight, no trouble has been met with in the tunnel proper, and the best kind of luck has attended the work. It was found necessary to take down the upper stories of Steele’s Building, which stand on the edge of the river, and whose foundations were in danger from the excavation. The wisdom of relieving the foundation of the superincumbent weight, is shown by the crack that is visible in the lower part of the wall. Had not precaution been taken, very likely the building would have come down by the run, and without warning. As soon as the dock wall is built, and the archway tested, the dam will be removed. There will be no necessity for removing it until spring, when navigation will be resumed, although it could be removed much sooner if required. 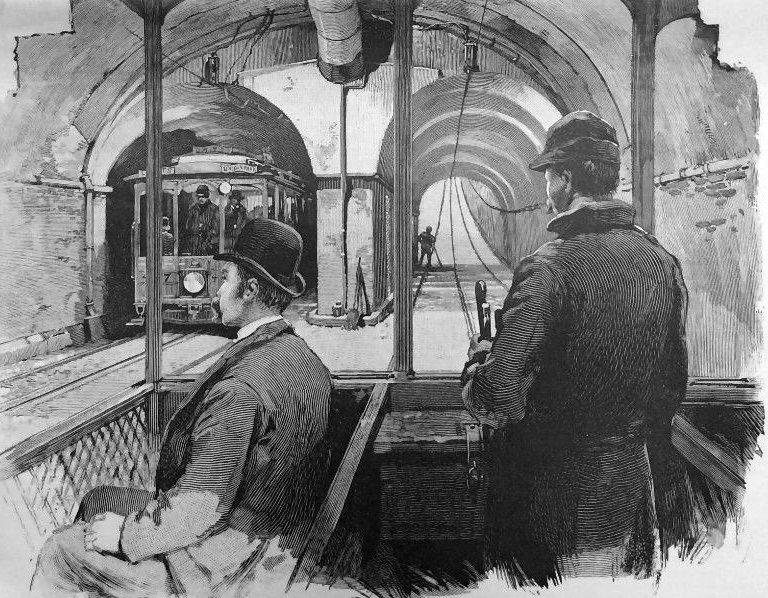 The contract calls for the tunnel to be finished on July 1, 1871. If no accident happens, it will be done before that date. The original estimate of the cost of the work is $427,000, but when damages, and all contingent expenses are paid, it will reach nearly, if not quite, $500,000. The contractors have received to date $196,467, so that they have a good round sum to earn yet. Mr. William Bryerson is the engineer in charge on the part of the Board of Public Works, Mr. Chesborough, of course, being the chief. Both of these gentlemen are doing all they can to have the work done in the best manner, and so indeed are the contractors, Messrs. Moes, Chambers & McBean. 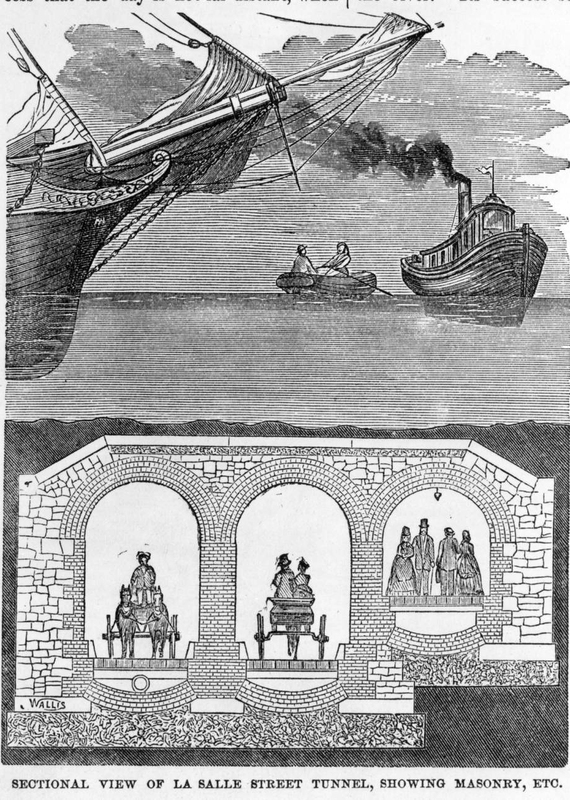 The LaSalle Street Tunnel was Chicago’s second tunnel under the Chicago River. It was started November 3, 1869, and completed July 4, 1871. It was designed by William Bryson who was the resident engineer for the Washington Street Tunnel. 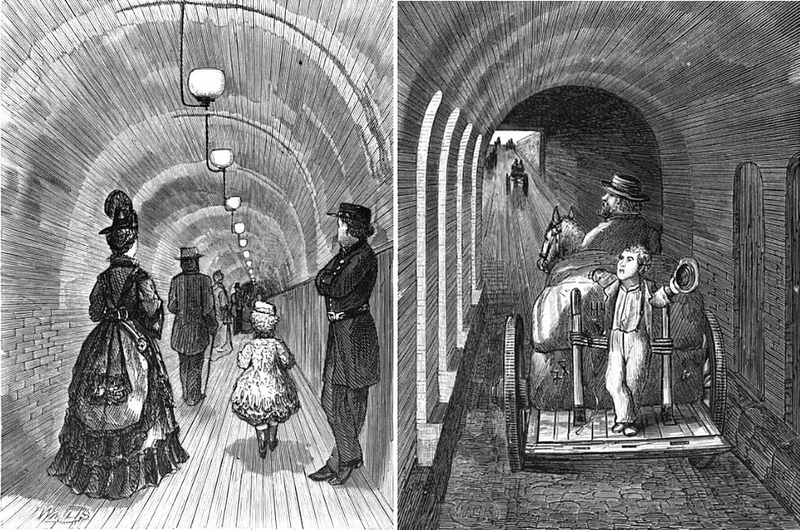 It was 1,890 feet (576m) long, from Randolf Street north to Hubbard (then Michigan) Street, and cost $566,000.This tunnel, along with the Washington Tunnel, were valuable escape routes during the fire of 1871, which quickly consumed the wooden bridges. 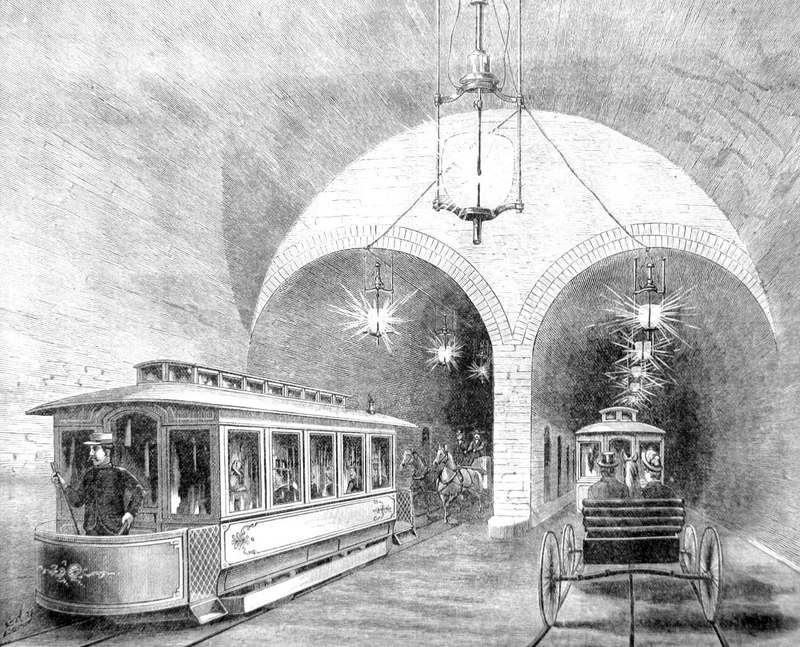 Originally built for pedestrian and horse-drawn traffic, on March 23, 1888 the North Chicago Street Railroad leased the tunnel, and it was used for cable car service until October 21, 1906. 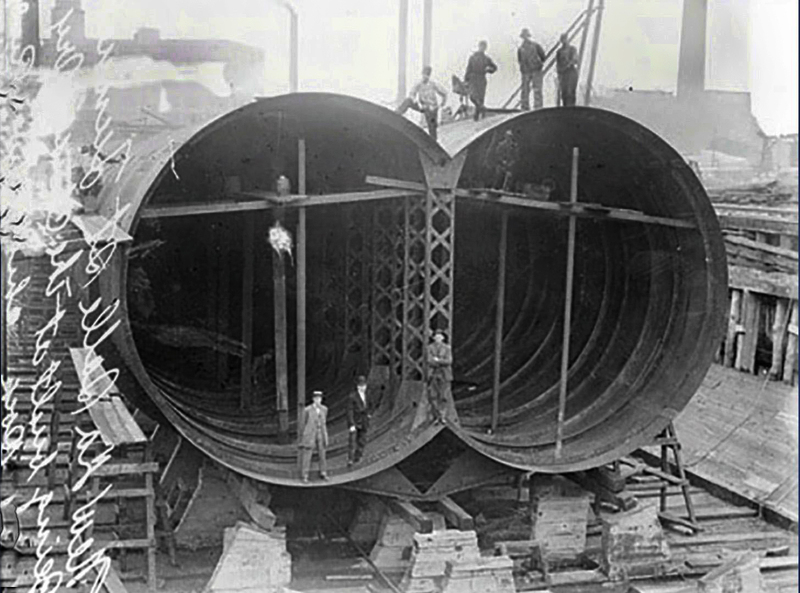 The reversing of the Chicago River exposed the tunnel in 1900 and a wider, deeper replacement was built in a drydock on Goose Island from steel plate. 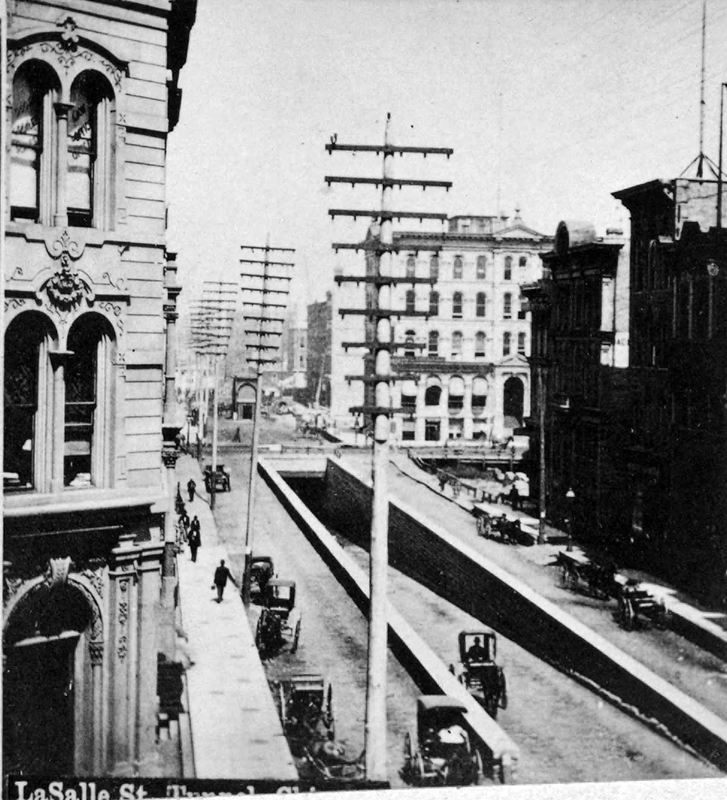 When the tunnel closed to cable cars in 1906 the replacement was lowered into a trench in the riverbed. It opened to electric streetcar service in July 21, 1912. The LaSalle Street tunnel was in use until November 27, 1939, when it was closed during the construction of the Milwaukee-Lake-Dearborn-Congress subway, the Lake & LaSalle (now Clark & Lake) station of which intersected the tunnel’s south ramp under Lake Street. By 1950 the south approach had been covered, the tunnel and the north approach were filled and covered by 1953. In the winter of 1872-1873, during a period of high unemployment, workers, who gathered to protest for poor relief and food, were forced into the LaSalle Street tunnel and beaten by police. This was known as the Bread Riot of 1872.